Bio Notes: George Clark Robb was born on 3rd February 1903 at Gordonville, 6 St Andrew's Road, Peebles, the eldest son of Alloa-born Andrew Robb (1869-1926), wood carder, and Christina Turner Clark(1867-1937) daughter of George Clark, a Master Joiner and Building Contractor in Morningside, Edinburgh. Christina Clark had previously been in service with the 3rd Marquess of Bute in London. 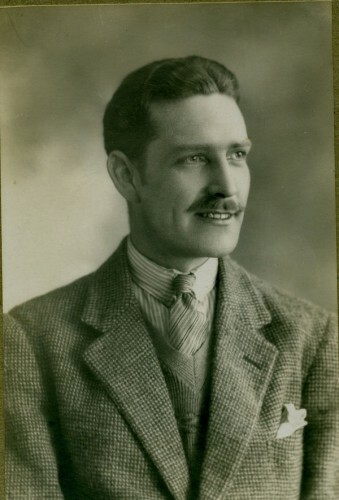 He had one younger brother Graeme Lambert Robb (1906-58). George’s father Andrew initially worked in Tweedside Mill where his father, also Andrew, was the Manager. In 1905 they moved to Edinburgh and Andrew took a Clerks job in Midlothian County Council Roads Office under his elder brother John. John Robb (1862 -1913) had practiced as an architect before becoming County Surveyor for Midlothian in 1897. He employed Andrew, and likely his two younger brothers James and David Haig, in the Roads Office and by the time of his early death in 1926 Andrew was Assistant County Surveyor. George’s brother Graeme also worked under his father as a Road Surveyor for Midlothian in the 1920’s, before jobs in Dunfermline, London and Maidstone, led to his appointment as Chief Divisional Engineer (Scotland) in the Ministry of Transport and Civil Aviation in Edinburgh. After a few years at various addresses in Newington, the family settled at 16 Melville Terrace, overlooking the Meadows. George attended George Heriot's School in Edinburgh from 1908 to 1919. Between 1919-1924 he studied at the School of Architecture, Edinburgh College of Art under George Washington Browne and John Begg. Drawings from his time here show a very classically based curriculum with measured drawings of historic buildings throughout the country and abroad. Whilst at the college he served his articles in the Works Department of George Heriot's Trust, from 1919 training under their Superintendent of Works John Anderson FSI (1863-1932), and becoming his assistant in 1924. George was likely responsible for the designs for a new Palladian-styled sports stand on Inverleith Row in 1925 (a recreation pavilion is in his RIBA application), and assisting in the conversion, to mining laboratories, of the Castle Brewery in the Grassmarket in 1926. He continued to work for the Trust until Anderson retired in 1929, despite having joined the Edinburgh City Architect's Office in 1927. From 1927 to 1936 he worked as an assistant in the Edinburgh City Architects Office under Ebenezer J. MacRae (1881-1951). MacRae later proposed him for RIBA membership noting that he ‘took every opportunity of learning all branches of architectural work’. He was involved in a variety of schemes including the design of council housing in Granton, although his designs here have been used elsewhere in the city. In August 1934, in Fortrose, he married Winifred Elizabeth Knight (1901-1954), an artist and secondary school art teacher and fellow graduate, in Fine Arts, of Edinburgh College of Art. She was the only child of Factory owner George Charles Knight and Catherine Grant. After her early death he returned to Edinburgh and in April 1959 he married Noreen Shaw, although this ended in divorce in March 1965. There were no children from either marriage. In 1936 he became Senior Architectural Assistant to R.A.H. Livett, Director of Housing in Leeds Corporation Housing Department. Leeds was then engaged in the construction of the Quarry Hill Estate, the largest social housing complex in the country. Between 1938-41 over nine hundred flats over 26 acres were designed in a distinctive modernist style with the innovative Mopin construction system (light steel frame and pre-cast and poured concrete), which due to lack of maintenance eventually led to demolition in the 1970’s. More traditional council housing at Halton Moor was also designed, likely by Robb. Alongside council housing Robb designed Shaftesbury House in Beeston, a massive six storey high hostel in brick with Crittal windows and Art Deco detailing. Originally designed for up to 324 men and 192 women, it was converted unsympathetically in 2007 to flats as the ultra-sustainable ‘Green House’. In 1938 he became Chief Housing Assistant to the City Engineers Department of Oxford City Corporation under Andrew Carstairs, and was responsible for the design of many of the council housing schemes in the city, including The Slade and Rose Hill. His designs in Oxford were firmly traditional, mainly two-storey terraces or semi-detached housing in brick with pitched tile roofs and multi-pane Crittal windows. Largely in a weak Arts and Crafts idiom borrowed from the Garden Suburbs movement, these forms were often combined with Classical or even Elizabethan detailing. 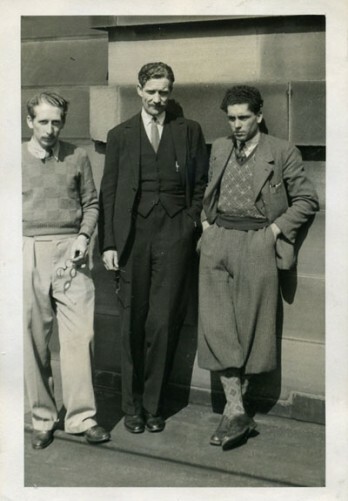 He had become an Associate of the RIAS in 1931 and was admitted ARIBA on 16 April 1940, his proposers being Ebenezer James MacRae, Alec Nisbet (b.1890) and Harold Francis Hurcombe, the latter two being architects in Oxford. In 1941 he returned to Scotland as Depute Housing Architect to Lanarkshire County Council, under County Architect Samuel McColl (1903-92), and was involved in wartime housing provision and modernist tenement designs. At the conference of the Scottish branch of the Town Planning Institute in 1943, George spoke on aspects of rural planning arguing that the war-time prosperity of agriculture must be maintained in the post-war period. In January 1945 George spoke at a lecture held in the National Gallery of Scotland under the title ‘Problems of emergency housing’. In September 1943 he replaced the retiring Alexander Nisbet Malcolm (1877-1955) as County Architect for Stirlingshire, on a salary of £800 rising to £1000, and was involved with the provision of rural and council housing in the county. In 1943 he was elected an Associate of the Town Planning Institute and was later a Member of the Royal Town Planning Institute. In May 1945 he was appointed County Architect & Planning Officer to Aberdeenshire County Council (at a salary of £1,000, rising to £1,200 per year). In this post he designed a housing estate in Kemnay, amongst other works. In 1948 he was appointed as Regional Architect & Planning Officer for the Highland Region in the Department of Health for Scotland, based in Union Street, Inverness (a position previously held by Sir Robert Grieve). This role involved giving professional advice to State Departments on housing, hospitals, welfare buildings, schools, prisons, police buildings, fire stations, agricultural buildings, research institutes and colleges. In addition, advice was given on the technical aspects of Town and Country planning, and the position was assisted by a staff of Quantity Surveyors, Housing Inspectors and Historic Buildings Investigators. The works for which I have been responsible and have carried out in local and central government offices include; housing, hospitals, schools, libraries, abattoir, Old Persons homes, municipal buildings, defence works, recreation pavilion, hostels etc. In the latter 1950’s he returned to Edinburgh in a planning capacity and took a position in the Scottish Office in St Andrew’s House, working under Grieve, who became Chief Planning Officer for Scotland in 1960. He then worked for the Scottish Development Department, formed in 1962 as an executive department within the Scottish Office with responsibility for Town and Country Planning. Robb worked as a planner in the SDD until c1968 when he retired, but continued to work as the Scottish consultant for the English architectural practice of Fuller, Hall & Foulsham. Throughout his career he had designed private houses for clients. In 1935 he designed a large house in Rose Street, Dunfermline for his brother Graeme’s then manager Hugh MacDiarmid, West Fife’s Surveyor. For himself he designed a house in Aberdeen in 1945 and later designed another, Gandria, The Ness, Fortrose in 1950. After his divorce in 1965 he bought and added an architectural studio extension to the rear of his Georgian flat at 24 Calton Hill which could not be described as contextual. The timber-faced studio features a large picture window and low desk-level horizontal window with views over the City, and was entered through a secret door set within a bookcase. Robb was 6ft 4in tall, a debonair and handsome figure often seen in either a kilt or plus-fours. Later in life he was silver haired with a moustache, and the family retains a kilted portrait from the period done by the noted caricaturist Emilio Coia that was once displayed in the National Portrait Gallery. He was a keen actor, directing and appearing on stage and screen under the stage name Michael Clark as well as his own. He once won an acting competition, the prize of which was a screen test in Hollywood, but due to his architectural career he was unable to take advantage of the offer. However, he did appear in several television programmes in the 1960’s and 70’s, notably in the popular series 'Dr Finlay's Casebook', the Scottish Independence terrorism thriller ‘Scotch on the Rocks’, and in several TV plays including Waugh’s ‘Scoop’ and the BBC’s Comedy Showcase -‘The Dirtiest soldier in the world’ by George MacDonald Fraser, where he played the Duke. He was a keen member of the Scottish Arts Club in Rutland Square, which included several fellow architects amongst its number, and was active in both music and the arts. Illness marred his later years and he died from bronchopneumonia on August 12th 1980 in Greenacres House, Lamancha, West Linton aged 77. His ashes were buried in Fortrose with his first wife. His will left his estate to Mrs Elsie Robb of 13 Braid Crescent, Edinburgh widow of his brother Graeme Lambert Robb. 42, Union Street, Inverness, Inverness-shire, Scotland Business 1955 * Address of the Department of Health in Inverness. 1938 Barton Housing Estate Oxford Oxfordshire England As Chief Housing Assistant in City Engineers Office, Oxford Corporation. 1938 Rose Hill No 2 Housing Estate As Chief Housing Assistant to the Oxford City Engineers Office. 1938 Slade Housing Estate Oxford Oxfordshire England As Chief Housing Assistant in City Engineers Office, City of Oxford Corporation Housing Department. Robb family archive Architectural drawings, photographs, letters and documents in possession of the Robb family Also notes from meeting with J Bryan Wade and Graeme Douglas Robb.